The Bravo! Vail Music Festival is pleased to announce that The Philadelphia Orchestra will continue to be a mainstay of this distinguished summer destination for classical music, with a three-year contract extension ensuring its presence in Vail from 2019-2021. The announcement was made by Bravo! Vail Artistic Director Anne-Marie McDermott and The Philadelphia Orchestra's Board Chairman Richard Worley and Interim President Ryan Fleur during its finale performance on Saturday, July 14, 2018, with esteemed pianist Daniil Trifonov. The Philadelphia Orchestra first performed at Bravo! Vail in 2007. More information about Bravo! Vail is available at www.bravovail.org. Highlights of The Philadelphia Orchestra's relationship with Bravo! Vail include the Festival debut or world premiere of works by Mason Bates, Guillaume Connesson, and Jennifer Higdon, as well as notable orchestral transcriptions created by the Orchestra's famed late Music Director Leopold Stokowski. Together, they also presented the Festival's first film screening with the live score, Disney's Fantasia in 2014, and the concert music of critically acclaimed film composer John Williams. The Orchestra also brought the circus to the mountains with the exciting debut production of Cirque de la Symphonie at Bravo! Vail. Early in his tenure with The Philadelphia Orchestra, Music Director Yannick Nézet-Séguin concluded the ensemble's 2013 residency with a triumphant performance of Verdi's Requiem Mass, which was broadcast live on Colorado Public Radio stations across the state. 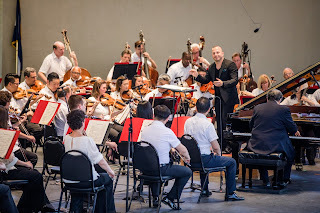 Additionally, the Orchestra presented a theatrically staged Shakespeare program in collaboration with Colorado Shakespeare Theater, selections from La bohème in concert with conductor Rossen Milanov, and a Jazz evening with the legendary Paquito d'Rivera. The Orchestra has also been an enthusiastic participant in Bravo! Vail's community and education outreach, dispatching musicians to perform in Free Family and Little Listeners @ the Library concerts throughout the Vail Valley. "Our partnership with The Philadelphia Orchestra has yielded some of Bravo! Vail's most innovative offerings," said Festival Artistic Director Anne-Marie McDermott. "The announcement of our first opera production, Tosca, in collaboration with the Orchestra, signals that Bravo! Vail will continue to evolve and pursue new artistic endeavors with this exceptional creative partner. We are thrilled for their renewed commitment to the Festival and Vail audiences." "The Philadelphia Orchestra has enjoyed more than a decade of memorable performances at the esteemed Bravo! Vail Music Festival," said Richard B. Worley, Chairman of the Board of Directors of The Philadelphia Orchestra. "We look forward to continuing this fruitful relationship with a partner that believes in the versatility of the Orchestra and the inspiring possibilities of symphonic music. This special collaboration enables us to present the most creative forms of our art for the devoted and appreciative audiences of Vail." For more information on Bravo! Vail, call 970.827.5700 or visit bravovail.org. The name BRUBECK evokes memories of the 1950's hit "Take Five" with the amazing sax player Paul Desmond but, nowadays, it means CHRIS Brubeck, who has written superb pieces for Canadian Brass, Time for Three, and Sharon Isbin. On August 11th at the Classical Tahoe Festival, Jaime Laredo & Sharon Robinson will give the world premiere, with conductor Joel Revzen, of the Double Concerto "Pas de Deux" that Chris has written for them. It's bound to be another great piece for Jaime and Sharon. So, if it's Brubeck or Brahms, Rozsa, Previn, Zwilich, Danielpour or more, you'll want to have Jaime and Sharon come and delight your audience. The last notes are still ringing from our incredible 2018 Summer Festival. And oh, what a Festival it was! Subscribe to our YouTube channel to see new videos of the Summer Festival. And be sure to follow our Facebook page to re-live the Festival magic by seeing the photos from all of our Summer events. Tickets for our 2018-2019 WinterMezzo Chamber Music Series are on sale now! Buy tickets online at http://www.festivalmozaic.com/wintermezzo-2018-19 or call our office at (805) 781-3009. The Orion Ensemble, winner of the prestigious Chamber Music America/ASCAP Award for Adventurous Programming, opens its 26th season with "Vienna, City of My Dreams," welcoming guest violist Stephen Boe. Performances take place September 23 at the Music Institute of Chicago's Nichols Concert Hall in Evanston, Illinois; September 26 at the PianoForte Studios in downtown Chicago; and September 30 at Chapelstreet Church in Geneva. Orion's first concert program of the season features Mozart's Clarinet Quartet in B-flat Major, after KV317d. Mozart's love for the violin and viola was second in his heart only to his beloved fortepiano. To open the season, Orion hosts a benefit reception after the September 23 performance from 5 to 7 p.m. at Vinic Wines, 1509 Chicago Avenue in Evanston. Guests enjoy wine, snacks and conversation with Orion artists, board members and concertgoers. The summer is almost over and we will soon be into the2018/2019 school year. This newsletter has lots of important information regarding the start of the year's activities. Please be sure to review important dates and if you have any questions feel free to call! This past year, we started a Mariachi program that is doing very well under the leadership of Ms. Marla Huizar. This year we are looking at creating a Beginning Mariachi class in which any FAYM student that has completed their first year with us may attend. We are still working out the details and are searching for a teacher for this class. We will have more information at the orientation meetings. Today, twenty-one arts leaders and activists announce the launch of Turn the Spotlight, a foundation created to pair top-tier mentors with exceptional women, people of color, and other equity-seeking groups in the arts. Beth Stewart, a New York City-based arts entrepreneur and classical music publicist, will lead the foundation, which is supported by an Advisory Board of arts world luminaries, including soprano Julia Bullock, journalists Anne Midgette and Celeste Headlee, conductors Lidiya Yankovskaya and Nicole Paiement, stage director Francesca Zambello, classical music publicist Mary Lou Falcone, arts advocates Monica Yunus and Camille Zamora, and women's rights advocate Amanda Mejia. "We believe that systemic change is crucial," said Turn The Spotlight Founder Beth Stewart. "We also believe that one-on-one mentoring can have real impact, particularly in an industry in which so many professionals are freelancers working outside an established institutional framework. Our mission is to identify, nurture, and empower leaders, and in turn, illuminate the path to a more equitable future in the arts." Philharmonia Baroque Orchestra's 2018/19 Season promises an eclectic array of sound experiences, with sacred vocal works by Bach, Mozart and Pärt, virtuosic concerti by Vivaldi and Geminiani, and Handel at his dramatic heights. Join us at one (or more) of these exciting season programs. Purchase tickets early while the best seats are still available! PUBLIQuartet has named the recipients of the 2018-19 PUBLIQ Access award (PQA), three composers with whom they will collaborate for the 2018-19 season, Vahid Jahandari, Gemma Peacocke and Niloufar Nourbakhsh. They will each receive a commission to write for PUBLIQuartet and get the chance to engage in high profile talks, panels and concerts featuring their compositions, performed by PUBLIQuartet. Additionally, The Violin Channel will share the composers' works in their New Music Tuesday feature and conduct an interview with each of them. 2018 marks the commencement of PUBLIQ Access Junior, which serves as an avenue of exposure for composers age 17 and under. This year's award recipient is Avik Sarkar. This PQA Junior award will allow him the opportunity to compose a 5-minute commission for PUBLIQuartet that will debut along with the other PQA composers on April 26th. Additionally, The Violin Channel will feature Sarkar's work in New Music Tuesday and conduct an interview with him. National Sawdust recently announced that PUBLIQuartet will be their 2018-19 Artists-In-Residence. All workshops with PQA & PQA Junior composers will be held at National Sawdust as well as performances of all four works on April 26th. Other residency performances by the Quartet are November 7th, 2018 and February 10th, 2019.